MOSCOW, Russia -- America’s booming natural gas production could help Ukraine keep the heat and lights on amid Russia’s latest threat to cut off supplies, if the U.S. cuts through troublesome red tape, lawmakers said. 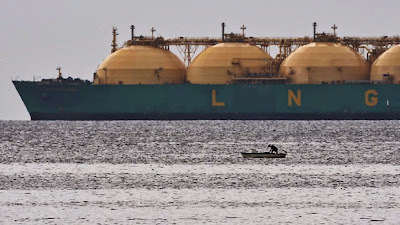 A fisherman stands in his boat as a liquid natural gas tanker (LNG) passes the coast near Havana. Russian President Vladimir Putin said state-run Gazprom will only deliver gas to cash-strapped Ukraine if it is paid in advance. U.S. lawmakers blasted the threat from Putin, who is backing an uprising by ethnic Russians in Ukraine, and said the U.S. must act quickly to keep Ukraine supplied. The U.S. has port facilities that turn natural gas into liquid for export and more are under construction, but shipping to any country not bound by a free trade agreement with the U.S. requires a federal permit. Since 2011, DOE has approved six applications for permits to export natural gas to non-free trade agreement nations, but Ukraine is not one of them. "Threatening to turn off the spigot of natural gas to Ukraine is nothing but extortion playing out on the global stage," said Rep Fred Upton, R-Mich., who chairs the House Energy and Commerce Committee. "This shameful act of defiance by Putin underscores the growing need for Congress to act on LNG exports." Upton urged passage of the so-called "Domestic Freedom and Global Prosperity Act," which would grant immediate approval of the 24 pending applications currently filed with the Department of Energy. "This would send the clear signal that we are serious about enlarging the scope of natural gas exports, and immediately undercut Russia’s dominance," Upton said. "Russia has chosen to wield its energy resources as a geopolitical weapon to inflict harm on others. As the world’s emerging energy superpower, America has a newfound responsibility to help our allies." Bill sponsor Cory Gardner, R-Colo., said fast-tracking permits to ship LNG to nations like Ukraine creates jobs in America while also serving out foreign policy interests. “It also serves our national security interests as an aggressive Russian regime looks to expand power in former Soviet Union countries," Gardner said. Gazprom controls nearly 20 percent of the world's natural gas reserves, and supplies more than half of Ukraine's energy needs. Although Ukraine recently signed a $10 billion deal with Chevron to drill for shale gas in western Ukraine, with the hope of ending its energy dependence on Russia by 2020, it is heavily dependent in the near term on Russia. Ukraine does not have the infrastructure to receive direct overseas shipments of liquid natural gas, but it does have pipelines coming in from European countries. The Netherlands and Spain are among the European nations with large LNG ports, although the logistics for getting the fuel to Ukraine would have to be worked out. And getting private suppliers to send LNG to a nation that is behind on its bills could present another hurdle. Putin first hinted at pinching the pipeline in an April letter to European leaders whose nations are customers of Russia's state-controlled Gazprom. But in the second letter released by the Kremlin Thursday, Putin said that a meeting involving Russian, Ukrainian and the European Union officials has failed to settle the issue. Putin said that Ukraine's gas debt to Russia has risen to $3.5 billion. "Given the circumstances, the Russian company has issued an advance invoice for gas deliveries to Ukraine, which is completely in accordance with the contract, and after June 1 gas deliveries will be limited to the amount prepaid by the Ukrainian company," Putin said in the letter. The move is part of Russia's efforts to retain control over its struggling neighbor, which has been teetering on the verge of financial collapse and facing a mutiny in the east, where pro-Russian separatists seized administrative buildings, fought government troops and declared two regions independent following Sunday's referendum. Putin sought to cast the move as a purely economic decision, saying that Russia is "still open to continue consultations and work together with European countries in order to normalize the situation." "We also hope that the European Commission will more actively engage in the dialogue in order to work out specific and fair solutions that will help stabilize the Ukrainian economy," he added. Ukraine has said it could start paying off the debt if Moscow restores the gas discounts canceled following the ouster of the pro-Russian president in February after months of protests.